Clinton Heating, Air-Conditioning & Plumbing Services. Clinton HVAC & Plumbing is the most-trusted name in the Clinton, IA area for HVAC, air conditioning, and heating installation and plumbing maintenance services. No matter what type of heating or air conditioning unit you have, we work with all makes and models. Our team possesses 17 years of experience, and we will change the way you thing about plumbing, air quality, and comfort for your residential or commercial property. We do not settle for anything but excellence in our workmanship. Our company dedicates time and energy to making sure our customers know we care. Every job we undertake begins and ends with quality. ​From the moment you contact us to the completed project, we strive to exceed your expectations. Every staff member listens directly to your questions and offers comprehensive answers. When you employ a dependable Clinton, IA area HVAC contractor, such as Clinton HVAC & Plumbing, we guarantee excellent results. In addition to installation services for your AC, hot water heater, or furnace, we provide routine maintenance to ensure your system functions accurately. We take care of your unit in the most professional way. Our team takes pride in the flawless reputation and more than a thousand happy and satisfied customers. Every team member is hand-picked to provide you with topnotch workmanship. When you call us, we will work around your schedule to find a time that works best for you. With our reasonable costs, you will know how much it you have to pay in order to repair your AC and heating, furnace, or hot water heating system. Our crew is available and ready to deliver exceptional service each and every time you call. It is in our core value to make sure your cooling, heating, or plumbing service is done right and your maintenance is regularly scheduled. When it comes to your hot water heater, due to safety issues, you should have your hot water heater serviced every year. A boiler is a piece of equipment that burns natural gas throughout your property. If you don’t perform regular maintenance, you and anyone else in your home or business runs the risk of breathing in carbon monoxide. Whether you need services for your home or business, we have the knowledge and skills that are required to get the job done on time and on budget. With services ranging from repair, maintenance, to new installations, we are the top HVAC and plumbing services provider in the Clinton, IA area. We always want our customers to think of us as the best. A dedication to customer satisfaction and attention to detail is what makes us different from our peers. 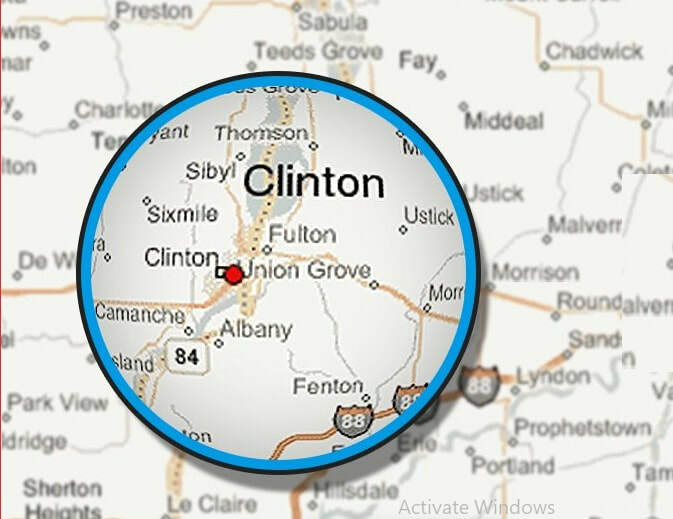 If you live anywhere in the Clinton area, we are ready to assist you with your heating, cooling, and plumbing needs. We are a business on a mission to create a level of customer satisfaction that surpasses our competitors. Our aim is to develop a lasting relationship with each customer year after year. It is our entire company’s personal responsibility to make sure that your heating and air conditioning repair and new equipment needs have been met in a manner that exceeds your expectations. We want to give you the very best so that your experience with us is a positive that encourages you to refer us to your family and friends. We deliver a trained, knowledgeable, and efficient technician to your door each time you call. Our company has been in business since 1999. Contractors come and go in this industry, but thanks to our returning customers and their referrals, we have provided continuous service for 17 years. Because we make training a priority, our technicians will pinpoint a problem in a minute. Our stocked warehouse allows us to have the parts needed on hand to solve AC and heating issues on the spot. 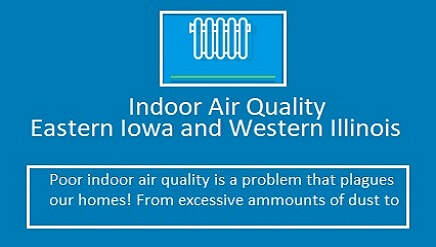 Indoor air quality and comfort is our main concern for your home. We established our company on a foundation of trust and dependability. When you have tried the rest, now try the best! We welcome the opportunity to serve you. At Clinton HVAC & Plumbing, we make sure our Clinton, IA customers get the most out of what they spend out of their pockets. With our many years of experience, we cater to all your air conditioning and heating requests. We do sales, service, and installation, and we make sure you feel comfortable in your property. Additionally, we provide low estimates on new installations. The most important thing is the quality and attention to detail we provide. With us, you will receive value and contentment. Whether it is a new plumbing installations or routine HVAC service, our objective is to keep your indoor temperature just right, regardless of the temperature outdoors. Our technicians undergo extensive training to provide our customers with the expertise needed to have their heating, ventilation, and AC systems in topnotch shape. We couple our expertise with a genuine concern for customer satisfaction. No matter the size of the issue, our technicians deliver attentive and skilled service. Regardless if you are looking for a new cooling system, need repair on your current heating system, or just need maintenance to keep things running smoothly, you have come to the right place. Our specialists are standing by to come to your rescue when your HVAC or plumbing system fails. They possess the knowledge and tools to diagnose and fix the problem. Your air conditioning and heating unit will work dependably for optimum comfort. 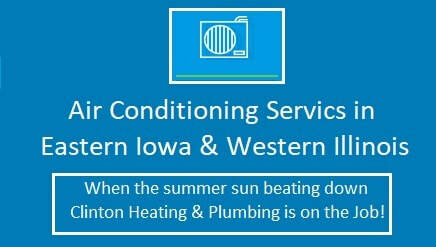 If you want the best plumbing, heating, and AC maintenance business in the area of Clinton, IA, reach out to us! At our company, we are here to assist you with your heating and cooling systems. For years, our HVAC contractors have provided services on all makes & models, satisfaction guaranteed. We are truly proud to be a locally owned and operated business. Our team gets the work done right, and we get to your home or business quickly and punctually. We are both licensed and insured; we stand behind our work. Our business is operated as a home comfort firm, and our staff believes in making things easy for our customers. Therefore, all plumbing, heating, or air conditioning repairs and installations are scheduled at a time that is convenient for you. We give you peace of mind, so you can enjoy the benefits of your home or business without worrying about something like a HVAC issue. Our skillful technicians and fully-stocked trucks handle any type of air conditioning or heating problem that you may encounter. Let our specialists take care of it, and you do not have to lift a finger. What set us apart from other HVAC companies are our competitive rates. We provide the best services for you and your home all year long. We work hard to stay the preeminent plumbing and HVAC contractor in the Clinton, IA area. Clinton HVAC and Plumbing is the residential and commercial expert for all your plumbing, heating, AC, HVAC repairs, installation, and maintenance issues. We sales a variety of HVAC units that best meet the needs of your home or business. You can trust that our Clinton HVAC technicians treat you how you deserve to be treated. We are dedicated to delivering first-rate service and customer satisfaction to homes and companies in the Clinton area in every aspect of the way we do business. This is our promise to you. Our satisfied and loyal customers have been coming to us for solutions to their plumbing, heating, and air conditioning needs. We established our company on a foundation of integrity and trust with a friendly and courteous staff. Any problem that arises with your plumbing, heating, and cooling is taken care of promptly and with efficiency by one of our HVAC contractors. With 17 years of experience, we are committed to providing you the highest level of comfort with cost-effective choices. We are passionate about delivering world-class plumbing, air conditioning, and heating repairs and installation services. Whether you need a new furnace or a quote on a new HVAC system, you will find out firsthand why we are well-known as the most-trusted HVAC sales and maintenance company in the Clinton, IA area. If you need the number one air conditioning and heating business for your home or business, use our professionals. Our mission is to provide topnotch plumbing and HVAC services. We sale and install all makes and models of HVAC systems. Whether it is for your residential or commercial property, we deliver fast response times, fair rates, and satisfaction guaranteed. With our estimates, we beat the prices of any of our competitors. Regardless of which air conditioning system or heating system you prefer, our HVAC contractor handles the job, from sales to installation. Our goal is to be your go-to business for HVAC services in Clinton, IA. Your search for a topnotch Clinton, IA HVAC contractor ends right here. We present top name brand equipment which is optimally complemented with the most advanced technological enhancements. Our business possesses vast experience in the HVAC industry. Over the years, we have earned a solid reputation for outstanding plumbing services as well. Our HVAC and plumbing company provides customized plumbing, heating, cooling, and indoor air quality solutions to fit the requests of each individual customer. Our highly trained staff is always on call to answer your questions, as well as offer advice about the latest energy efficient home heating and cooling products. Whether you are a Clinton homeowner looking for someone to repair your plumbing immediately due to a leaky pipe, or a business owner seeking a AC and heating contractor for your new office building, you have come to the right place. Our HVAC technician fixes your HVAC system correctly the first time. If your HVAC unit is over 10 years old, or your home is not cooling properly, you should have it inspected by a professional HVAC contractor. As the top business for heating and cooling systems in Clinton, IA, we will check for issues, such as big air leaks in your home, leaks in the air duct system, and other potential problems you may have in your HVAC system. Your heating and cooling system will show you definite signs when it is time to be replaced. In a climate that can be unforgiving at times, productivity and comfort depends upon well-maintained heating and cooling units. We specialize in installation and repair services of cooling systems and humidifiers. Our professionals work to maximize your investment through precision diagnostics and routine equipment tune-ups. We know that the summer months in Clinton and the surrounding areas can bring unpleasant high temperatures. Many residents need to keep their AC running during the day and most of the night. We are your source for prompt, courteous, and affordable cooling services that will be done right the first time. Our goal is to address any problems you have with your HVAC system in an efficient manner. We value your time, and this is why we guarantee our technicians will show up when you expect them. We want you to be completely satisfied with any of our cooling maintenance services. Our cooling, heating, or plumbing services will never leave a mess on your property. Our techs will thoroughly clean the work area at the end of the work day. When your comfort is at stake, you deserve only the best. If you are in need of expert service for your plumbing or heating/cooling unit, try us. We are the leading company for AC, heating, and plumbing systems in Clinton, IA, and we specialize in repairs, installations, and replacements of any unit size in the market. We are fully dedicated to our customers. 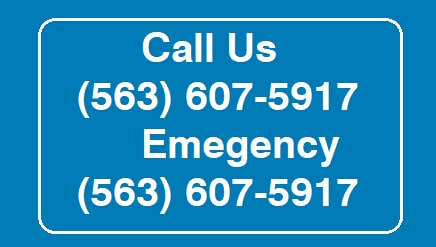 When you call us, there is no need to worry. We are problem solvers. We are reliable, and we are honest. Our heating, cooling, and plumbing professionals will respect your time and your home by focusing on delivering superior service without cutting corners. We possess the ability to install or repair every major brand of plumbing, cooling, or heating system in the market. Our trained technicians are in your corner to troubleshoot or maintain your current unit. 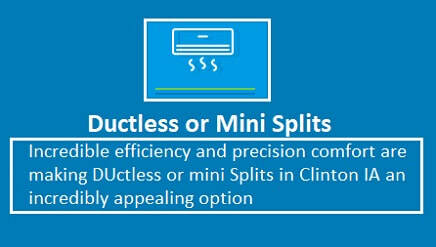 We understand that a heating equipment malfunction is one of the worst things that could happen on a cold Clinton night. With us, what started feeling like a disaster will soon be a memory. We will restore the comfort to your living space and put your initial worries safely to rest. Anytime, day or night, our heating technicians are ready for your call. Even while in the field, our team is always in contact with our home base, guaranteeing you will receive the help you need as quickly as possible. Additionally, we also provide 24-hour plumbing services. We are the HVAC contractor who repairs units, regardless of make or model. Our recommendation is for you to get a comprehensive checkup of your heating and cooling unit. You will find this service a necessity, since it helps you get out of unnecessary repair costs. When you are ready to get your AC and heating unit, as well as your plumbing, examined, schedule an appointment with us! We are extremely skilled, licensed plumbing, heating, and cooling experts who give you low estimates to help you decide on the right system to meet your specifications. When you need service for your heating, ventilation, or air conditioning systems, you can count on our HVAC professionals. We know that as your heating and cooling systems ages, it can lose efficiency and even break, and picking just any HVAC technician can be costly and counter-productive. Regardless if it is residential installation or commercial installation, we are devoted to providing each Clinton, IA customer with the best in plumbing, heating, and air conditioning installation services and products, ensuring that your system is working accurately. When it is hot outside, we want our customers to be nice and cool inside their homes and businesses. No job is too big or small, and we aim to deliver complete customer satisfaction on every project we undertake. We offer a wide variety of reasonably-priced name brand air conditioners to meet your specific demands. When you employ us for air conditioning installation service, our technician sits down with you to discuss your needs and help you find the best air conditioning system for your price range. We pride ourselves on working hard to ensure not only affordability and complete customer satisfaction. We deliver AC installation that you can depend on, try our team! Selecting a competent professional for repairs on your AC and heating unit can result in a comfortable return to coolness. 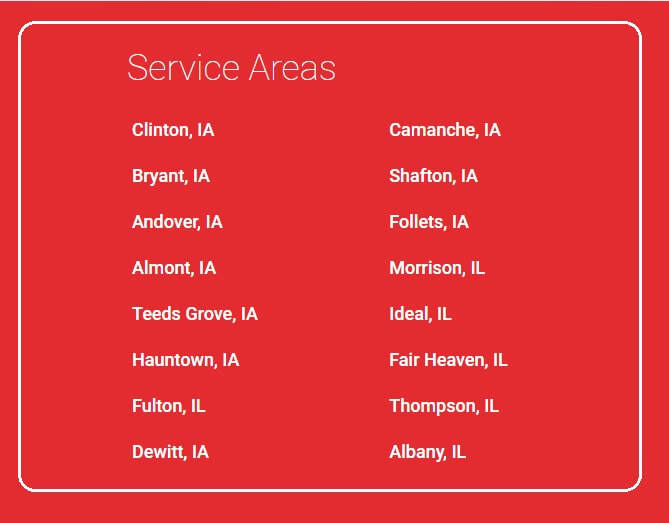 As the preeminent business for heating and cooling repairs in Clinton, IA, we strive to keep heating and AC units running smoothly and effectively. We are fully licensed and insured for your protection. Regardless if it is residential repair or commercial repair, we take the time to listen to your wants and needs. Then, our technician creates a unique solution to fit your home or business. Even if your heating, air conditioner, or plumbing is relatively new, it can be considered inefficient by today’s energy efficiency standards. With the increasing demand for technically advanced, eco-friendly plumbing, heating, and air conditioners, you need a HVAC company that stays abreast of the latest developments and techniques in repairs. When it gets warm outside, do not let a broken air conditioner keep you from enjoy the lazy days of summer. Instead, let our air conditioning repair experts give your job the attention and focus it deserves. We make sure that every customer receives outstanding professionalism. Our intention is for your experience with us to be hassle-free and pleasant. We have the best plumbing crew in the industry, and our plumbers come with a wealth of experience. We are always on schedule, and we are clean, leaving the work area free of debris at the end of work day. We treat your property as if it were our own. Our number one priority is to complete your plumbing project to your satisfaction. Working with a plumbing contractor should be easy. We listen to your exact requirements, and we finished your job within your time frame. Our staff loves to establish lasting relationships with our customers. Regardless if your plumbing job is large or small, we are here to help you by delivering work of the utmost quality. We know that plumbing is a service-oriented business, and our job security comes from satisfied and repeat customers. Our crew is respectful and courteous at all times. Every plumber who works for us undergoes regular training to remain the top plumbers in the industry. Experience and knowledge are important components when choosing a plumbing contractor, so we welcome the opportunity to show you what we can do. We look forward to assisting you in finding the best solution for your heating, AC, and plumbing maintenance project. With our affordable estimates, we build your trust and become a partner in your home or business comfort needs for many years to come. If you are in need of plumbing, heating, or air conditioning repair service for the summertime, or any other time of the month, ask Clinton HVAC & Plumbing. 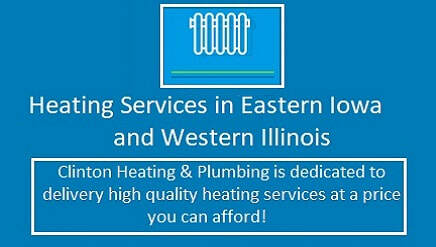 ​Clinton HVAC & Plumbing has been the company for exceptional plumbing services in Clinton, IA since 1999. It is our aim to make your home or business functional and reduce your energy bills at the same time. We know that your home or business is an important investment to you, so you want to make sure they all the systems operating inside of it are always on point. We do not often think of the plumbing until something goes wrong. Perhaps there are some odd noises to indicate that your plumbing system needs repairs. However, there is typically no advance warning. Whatever your particular situation, you want a plumbing, AC, and heating company that responds immediately. Our Clinton, IA plumbers are trained, and they will arrive in well-stocked trucks prepared for most plumbing repairs on the first trip. You will feel confident calling us, whether it is the middle of the week, or in the middle of the night, as we provide 24-hour emergency plumbing service. ​Clinton HVAC & Plumbing is the number one provider for high-quality hot water heater services for Clinton, IA area residential and commercial properties. Our extensive knowledge with a huge variety of hot water heaters ensure that your home or business is always safe and the hot water is flowing properly at all times. We offer fast, proficient troubleshooting services that deliver a better and more efficient way to heat your water. For health reasons, we know that hot water is imperative. In addition to hot water heater installation and maintenance services, we provide services for furnaces. 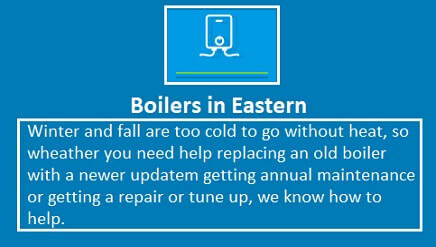 Many people own furnaces to heat their homes/businesses and hot water heaters to heat water for house and business use. Furnaces can be resourceful, but they require proper maintenance and installation to accurately work. Regardless if you need repairs, or a new furnace installed, the work should be performed by a knowledgeable Clinton, IA HVAC technician who knows a great deal about furnace systems. If you are a business in need of a hot water heater, our team is ready to work with you. We have been in the HVAC industry for 17 years, and we know our way around all types of hot water heater systems. Our business customers are happy knowing their hot water heater installation or repairs are done by world-class experts. For outstanding hot water heater maintenance services, you can rely on us for excellent workmanship. Our specialists are able to service your hot water heater to ensure that you have hot water for everything, from the dishwasher at home to the one at your restaurant. If you need your hot water heater inspected, come to Clinton HVAC & Plumbing.